Araphahoe Ridge as seen from Eldorado Canyon. Photos copyright Glenn Cushman. 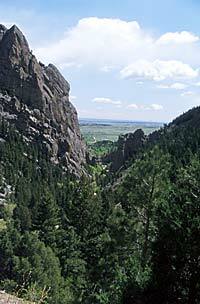 About four miles southwest of Boulder off Highway 170 lies Eldorado Canyon, home to some of the worlds best and most difficult  technical rock climbing. Known for its sheer, fountain-formation sandstone faces rising 800 feet or more above South Boulder Creek, this climbers destination features such renowned routes as Wind Tower, Redgarden Wall, The Bastille and West Ridge.